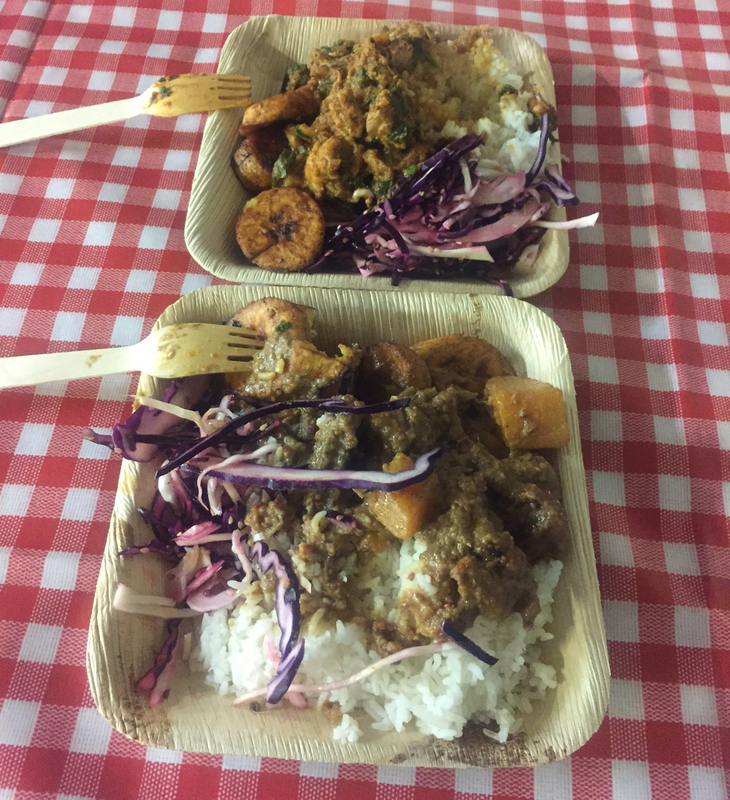 We attended the Carnival Expo on Sunday, which was held at The Kia Oval in Kennington, and were blessed with a very nice sunny day. After our arrival, we were given our wrist bands, and we were ready to explore what the whole Carnival Expo is about. As you would expect from a Carnival event, the place was decorated with a lot of vibrant colours and the soca basslines were pumping out. There were quite a few men and women in their fancy and colourful carnival outfits, which we assumed were part of the event, and associated to the various carnival stands, rather than people thinking it was a fancy carnival dress party, and came in dressed that way! The tour of the place did not take us too long, as there were only about 20 stands, and we only browsing. 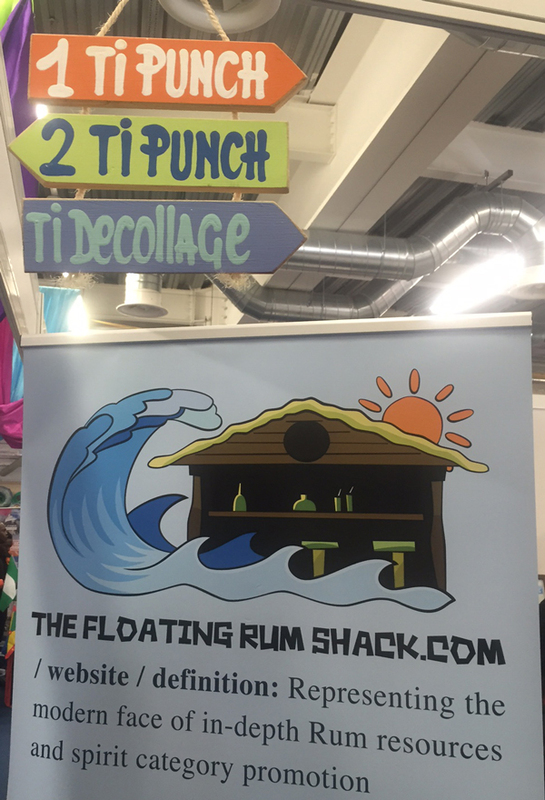 The stands were mainly related to carnival outfits and accessories, and rest ranged from dance classes and workshop, jewellery, travel, Soca music events, clothing, food, beverage, and last but not least, the rum stand of our buddies from TheFloatingRumShack.com! Now down to business at The Floating Rum Shack stand, where we were greeted with a lovely site of various brands of rums, which also included a bottle of another sugar cane spirit, Cachaça. 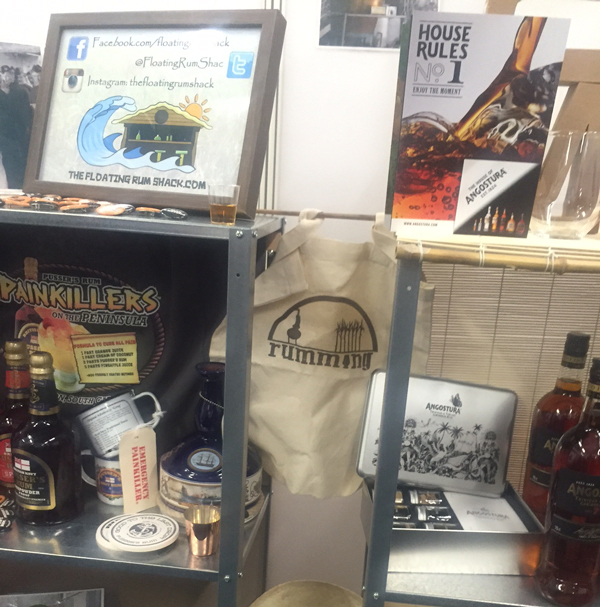 The rum stand was a hit, as there was a constant flow of people who were curious to find out about the various rums on display. Apart from the usual partners in crime, Roger from “Spirits Elite” and Stephanie, founder of “Behind Bars Akademia”, were there to give Pete and Pauline a hand with the rum shack. 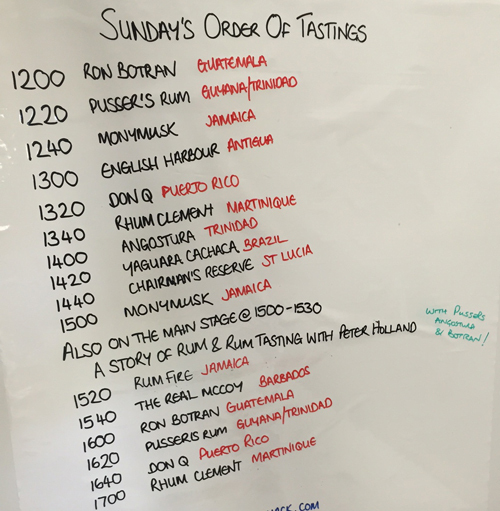 As good students do, we tasted almost all the rums that were offered to us on the day. We were pleased to have some new rum education from Roger, who looked after Monymusk, English Harbour and Rum Fire brands. From Pete’s side we got some rhum agricole and Cachaça education, with both helping out in educating the crowed with the various brands on display, as the event progressed. 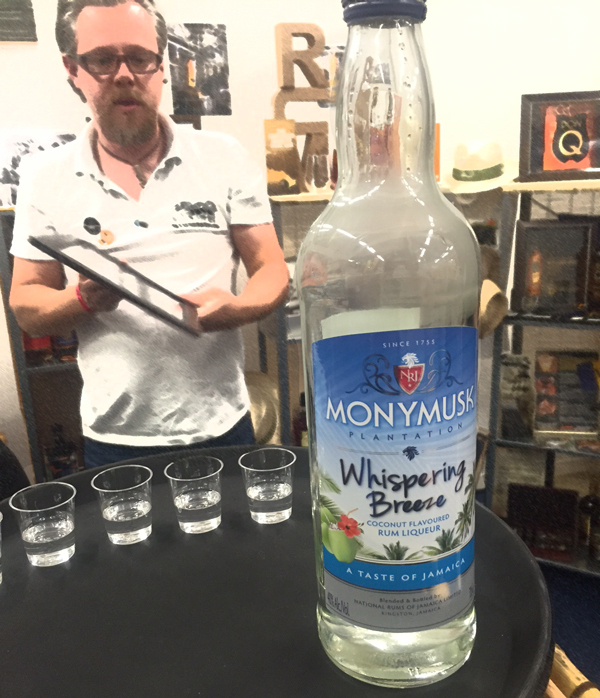 Monymusk is a rum brand from Jamaica that we have not tried before, and we were pleasantly surprised when we tried the Monymusk coconut flavoured rum, as you could taste both the rum, which is at 40% ABV, and the flavour of real coconut, rather than a synthetic flavour more commonly found in commercial coconut spirits. We think that this rum will work really well in cocktails, but was even nice enough to be sipped neat. 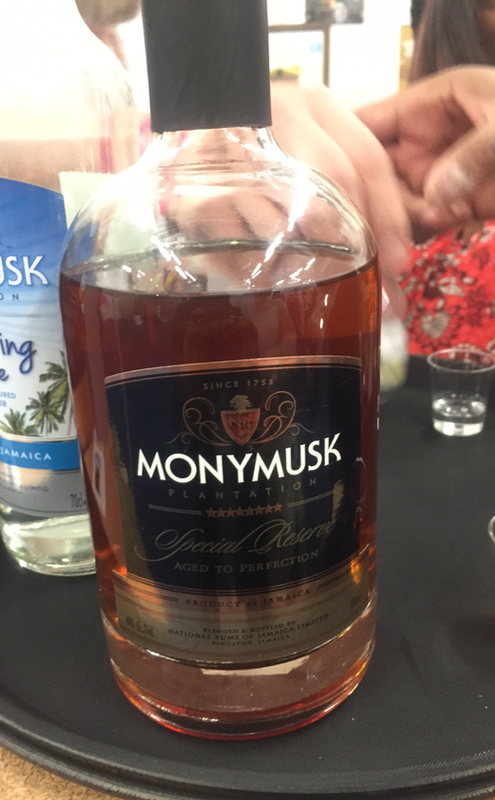 The Monymusk Plantation Special Reserve, is a fairly recent addition to the very reputable ACR (Authentic Caribbean Rum) family. The rum is a blend of aged rums, but with no age statement on the label. It is also non-chill filtered, which gives it a bit of a cloudy look, but this helps the rum retain some extra flavour, which the filtration process usually removes, in favour of a clearer looking spirit. Roger also introduced us to the English Harbour rums from Antigua, made from copper-piped continuous stills. This was also another brand that we have not tried before, and we have tasted quite a few, considering that we have now attended 5 UK Rumfests and 1 RhumFest Paris! The 5 year old is an award winning rum, which was very smooth, with some oaky, sweet and spicy notes. At below £30, we think this is good value for money for what you are getting. Definitely another aged rum to add to our sipping rum collection! 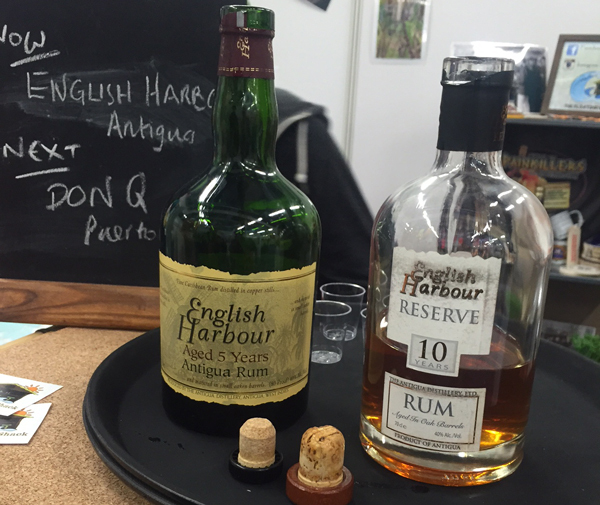 The English Harbour 10 year rum, was our favourite out of the two, as we found that it packed more flavour. The rum was still oaky, with more dried fruit flavour, and also had a bit of smokiness to it. At around £75, you can now see why the 5 year old is very good value. Roger told that us English Harbour are working on getting the 10 year old rum price lowered a bit, to make it more affordable, as there is already a lot of competition in the 10 year and older bracket. A rum fact about the Antigua, is that it has no rivers, and is one of the drier countries in the Caribbean. This dryness results to a higher percentage of rum lost to the duppies, and this also means that the aging is slightly faster in that part of the world. We really like how Roger said that it is hard to tell someone new to rum, that rum ages faster in the Carribean, as he says: it would be like saying that a 3 year old child in Jamaica is the same as a 9 year old child in Scotland! In order not to pass out after all these great rums, we went to find some food at one of the food stands, and we opted for the Ghanaian food, which we fully enjoyed. After our food, and before we headed back to the rum stand, we went for another little walk around, as it got a bit livelier, and the party atmosphere was picking up. 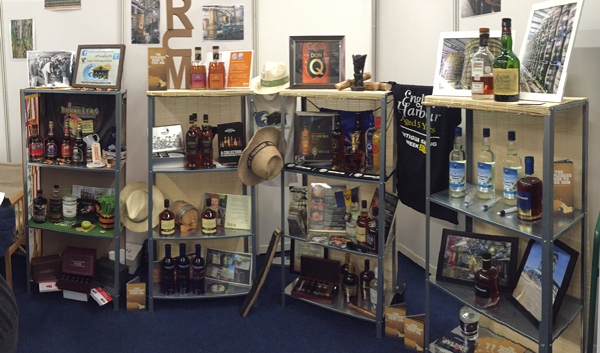 Back to the stand, we were on the French style rum, where we had Clement, one of the more popular Rhum brands in the UK (we think). We have tried the un-aged, and 125th Anniversary VSOP, which came in a very fancy bottle, and was the one that we have not tried before. We tried both of them neat, and in a mini ti-punch. Rebecca preferred the un-aged one in the ti-punch, which is a classic, but I really like the aged one, it had a funky finish, which I liked. We also tried some one other brands, which over the years we are now quite familiar with. Some of the brands were Chairman’s Reserve, The Real McCoy, Matugga, Pusser’s, Don Q, Angustura and Botran. Pete had Cachaça Yaguara on the menu, which is not rum, but another flavourful sugar cane spirit, and unique to Brazil. It is very similar to the French style rum agricole, as they are both made from sugar cane juice rather than molasses. The Cachaça tasted earthy, grassy, and sweet, with a lovely sugar cane juice smell. Blind folded, it would be hard for us to tell it was Cachaça, as it was very rhum agricole like. 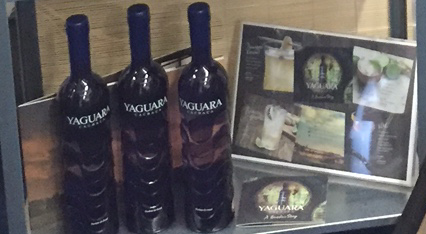 Tasted neat, the Cachaça Yaguara was much easier to sip compared to some Cachaças that we have tasted in the past. This might be due to the fact that some of the spirit is aged in a Carvalho oak for 5-6 years, and blended in order to create this this Cachaça. You can find out about their process here: http://cachacayaguara.com/EN/index.html. 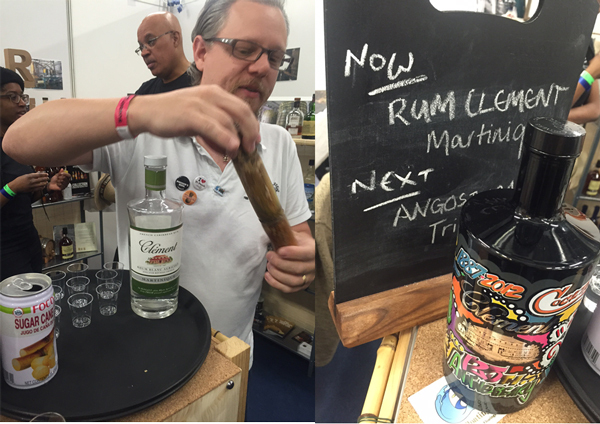 Last but not least, Pete introduced us to two work in progress rum samples from St Lucia Distillers. These rums were made from pot still, and bottled at barrel strength! The 6 year old rum, at 56.99% ABV is no sipping rum, even though it was full of flavour. The same goes to the 15 year old, which at 66.85% ABV gives you that burn in the throat after a sip, as we are still learning the art of sipping overproof rums! With the latter, we also got a slight smell of glue, luckily that was only on the nose, and didn’t come through when we tasted it. It was a very interesting experiment, trying these rums at barrel strength. Both rum would be great once blended, and we were lucky to have managed to taste some. Now we are going to wait, hoping that they get turned into some amazing products in the not too distant future. 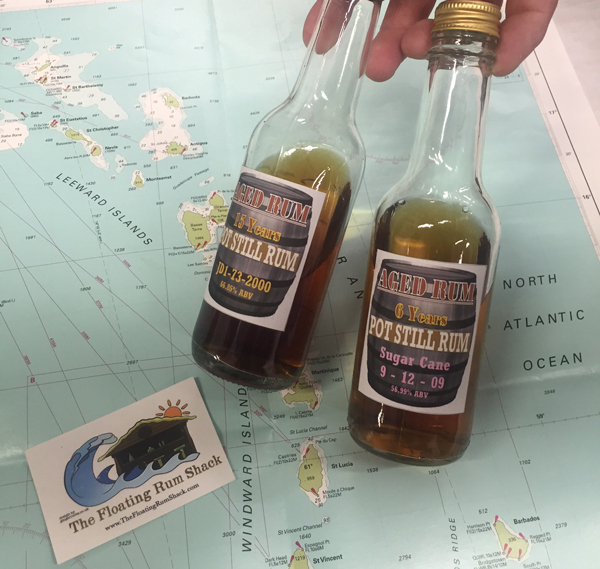 We greatly enjoyed the rum education on the day, and we would like to thank The Floating Rum Shack crew for that experience. Getting the rumming bag featured on the stand was also much appreciated! We are looking forward to attending more rumming events from this lovely bunch in the future.